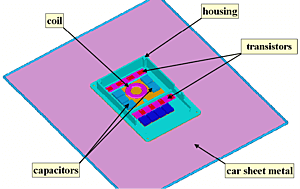 The top figure shows the thermal model, which includes the housing, the relevant electronic components and the vehicle’s sheet metal adjoining the module. Since the module is only operated during short intervals, the heat up process is most important. 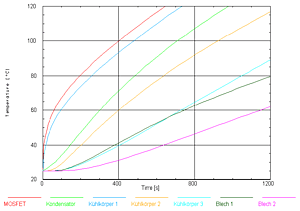 The convective thermal coupling of the cooling fins to the surrounding was calculated by separate CFD simulations at several velocities and mounting positions in the vehicle. The worst case is mounting the module to the bottom of a standing vehicle. In this case, the free as well as the forced convection vanish and the total heat has to be transferred to the vehicle’s sheet metal. In the real application, the module is loaded 4 [min] at most. 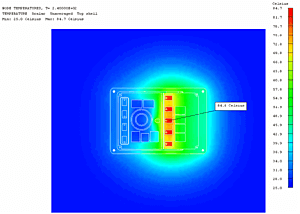 The center figure shows the temperature distribution on the power electronic module and the vehicle’s sheet metal for the worst case, 4 [min] after switching on the module. The bottom figure shows the temperature behavior at several positions on the module and the vehicle’s sheet metal. After 10 [min] of operation, the temperature at the highest loaded electronic components exceeds the critical temperature of 120 [°C]. Due to the weak coupling to the surrounding, the stationary temperature distribution is reached much later. The investigations show that the current housing is over-dimensioned with respect to its thermal requirements.